The Angus coastline is a wildlife watching secret and is home to a wide range of coastal and marine habitats and species. The Marine Life Angus website is an introduction to some of these sites and species and gives you the opportunity to log any special sightings. This information is used to help understand and conserve our maritime habitats and species. 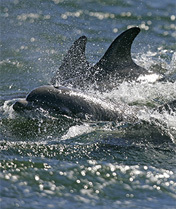 A.C.A.P is a cetacean survey and data collection project in Angus waters and along the coastline. The purpose of the project is to learn more about cetacean presence in the Waters off Angus and to report this information to the Tayside Biodiversity Partnership and bodies like the Whale and Dolphin Conservation Society. This project has been made possible by the valued contribution of organisations and individuals.